My daughter has a cat that had kittens a long time ago before we could get her spayed. When we would bring in a kitten from the shelter she would not wash them or anything but would take the responsibility for teaching them. Sherburt liked to play in my toilet. Evelett was bringing in live critter to teach him what to hunt. Yes, you got it. One morning when going to the bathroom I found a live mouse in there. Surprise - surprise! Mine hardly ever find a mouse in the house anymore but, when we first moved in, they would catch them and carry them in their mouth alive trying to hide from the other cats and me because they knew that I would take it away from them. Raya, the feral turned tame, is a truly extraordinary cat because she did not only become tame after being born and living for, at least, 2 years on the street but she is the calmest, sweetest, most affectionate cat ever! And so very maternal! This morning, I fed the little ones but, about two hours later, I had to use the bathroom [I keep them in a large box with a heating pad covered by a baby blanket in it] and Raya and two of the older kittens followed me in there. The tiny kittens woke up and were moving around [they can only drag themselves] and one of them meowed so Raya looked inside the box, jumped in and proceeded to groom them and, when they started looking for her teats, she laid down to feed them. She has already raised the other 8 almost all on her own [I helped by supplementing her feedings] and now she is helping raise these four - what a sweetheart of an animal! Better than some human mothers, that's for sure! The mouse came from outside. I called my son and he came over with tongs. He picked it up by the hair on the back of it's neck and released it in a wooded area across the street. Poor Duchess died last night. In the morning, when I cleaning their cage, I noticed that she had her eyes closed [she wasn't quite asleep because her head was not 'tucked'] and made a mental note to keep my eye on her but she had no discharge from anywhere, no diarrhea, no labored breathing so I did not put her on anything. And she did go down to eat her breakfast and her dinner... But, this morning, she was dead. I don't know how old she was but she was not a young bird and, most likely, was fed wrong her entire life, poor thing! I am so sorry that you lost her. I know how you feel. It has happened to me a couple times when the bird is active but dead in the morning. We don't know the history on our rescued birds or their age. It could have been anything. Her beak was HUGELY overgrown when she first came here -so much so that I don't know how that poor bird managed to eat enough to stay alive!- so I knew that her liver was in trouble but I still had hopes that I could keep her alive long enough for her to enjoy a good life for a while - but it was not to be, poor, poor thing! I need to post a complete update but I thought I would let you know that Keku has started talking and she is on a roll! In the last two weeks, she has started saying "Come on" "Come here" "Pretty bird!" and "What a pretty bird!" [these two are said right after a wolf whistle] and "Que rick" which, I hope, will turn into either "Que rica papa" [what tasty food!] or 'Que rico beso [what tasty kiss] but I think it's the kiss one because she always says it after we kiss. Quakers are, in my personal opinion, excellent takers - and as smart as grays, too! I'll bet it feels like when your human baby began to talk. Liz reminded me that I had not posted an update for a while - and it's true. But it's not because I don't care, it's that I am always so busy. I also know I am always saying the same thing but it's true. Right now I have kittens number 21, 22 and 23 of the year. 21 and 22 are going to their new home next Monday but I still have to have 22 checked by a vet, tested and dewormed [I am taking her and number 23 tomorrow to the vet]. 23 will take longer because he is only 2 weeks old and the only reason why I took him in so young is that his siblings showed up dead two mornings ago [2 in my backyard and 1 in my front garden]. I also took in two birds - but i will tell you about them separately. So, here we go: Canaries all doing great. Molt is done and I think there is at least one male in the last clutch of babies [first clutch was all girls]. Button quails and cardinal doing well. Poor little Yaga Finch is not though... 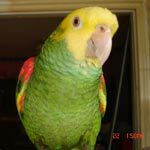 But, in truth, this bird always looked as if he was on his last legs [no feathers, only one foot and with only two toes that have no claws, etc - my husband calls him 'el espantapajarito' -the little scarecrow] and he still outlived everybody else. He is still eating, drinking and pooping good but he has been spending an inordinate amount of time sleeping in the middle of the day and that is never a good sign. Budgies are doing great! They are still molting but I think that it's mostly the sisters [Margarita and Marigold] that are going through their juvenile molt because it looks as if all the feathers are yellow contours. They are happy little things! Chirping and chattering all the time... And boy, do they like their gloop! I called my husband to the cage yesterday morning to show him what happens when I put down the plate with gloop and he was fascinated [he LOVES budgies!] because they do this weird thing: as soon as the plate is down, they all fly down to it and perch all around the edge, leaning in and grabbing a piece of something - then, they immediately climb down, walk around while chewing and perch on another spot to do the same thing. The funny thing is that they all do it at the same time so it ends up looking like a dance with all of them weaving in and out around each other and around the plate. I don't like how Duke is doing though... He is way too eager for his food and I've seen him sleeping in the morning so I am going to start them all on liver cleansers. Codee GCC and Pablo Peachfront are both doing very well. Codee continues to be her sweet self and Pablo keeps on going and going like the Energizer bunny His tail feathers all broke and his remiges are beginning to grow again so I am going to have to clip him soon but he is now taking 'cookie' from my fingers so YAAAAYYY for Pablo for that! Mami and Naida Zon are looking mighty good these days because they molted and now have feathers on their chests - feathers that will be overpreen until they are only shafts by the time the next breeding season is upon us but it's OK. Poor Mami's feet and legs are getting worse from her arthritis so I am going to be getting some supplements when I go to get more herbals for them. Precie and Zeus Zon are also doing very well. Zeus is actually becoming more and more sociable - not that I expect him to revert to being a pet after his abuse but there was not a single attack during the entire breeding season and he now comes close when I call him [with a treat as a bribe in my hand, of course ] They have gotten so good that they even obey my husband when he tells them to 'Go home' [meaning going into their cage] when he has to work in the birdroom [he is still afraid of them]. Sophie Gray is, apparently, a happy girl because she no longer plucks her legs. She had started some years ago when Ellie was kind of bullying her and continued after she left us but her legs are completely feathered now. Linus Too is looking very handsome these days because he has more feathers than ever. They will not last but every year he allows more to grow before he plucks them and more to remain so, although it doesn't bother me when birds pluck, I do rejoice when they seem to be getting better. He has also warmed up to my husband and, the last time he was in the birdroom fixing things [he needs to do it again kind of yesterday but he has been working a lot lately], Robert said that he was dancing and showing off his 'moves' for him. Zoey and Sweetpea Senegal are in breeding condition which means Sweetpea is chewing up a storm and I find myself looking for the right kind of boxes everywhere - I say the 'right kind' because they need to be not too small, not too large and VERY hard, otherwise, he doesn't like them Zoey is, as usual during her breeding season, VERY affectionate which has created a bit of a situation with Keku but we are weathering the storm and things are getting better. Javi continues to improve. He has been here a year and he can now fly -which he did not do at all when he first came. I've been making him exercise his wings almost every day and, last week, he flew in a perfectly horizontal and parallel to the floor line for about 18 ft!!! He is also now saying 'Come on' whenever he wants me to put my hand out to him for stepping up. First he says Javi! Javi! and, as soon as he sees me, he goes "Come on" Unfortunately, I noticed the other day that he is still getting some pins on his cheeks so I am going to reduce the protein even more this winter. Isis and Davy RedBelly continue not bonding at all... Isis doesn't seem to care at all for him -not that she is mean or anything, just standoffish- and he no longer minds if she or Zoey ignore him because he is IN LOVE with Keku who seems to return the sentiment. Aside from that, they are both doing very well in terms of diet, flight, plumage, mood, etc. Davy continues being the most pain in the neck bird and, now, Keku has picked up all his bad habits! Keku Quaker.... Ahh, my little Keku... I am ashamed to say that she is my favorite. I don't like to treat any of them differently but I am sure that no matter how hard I try to not to show my preference, I am failing. She is soooo adorable! And she has changed so much! She now comes when I call her and has learned to say more stuff than 'Pretty Bird' and 'What a pretty bird! ', she says: 'Come here!' 'Come on!' 'Come on - come on - come on' [with a tone of urgency or maybe impatience that I must be using because otherwise she would not have learned it] 'Que rica papa!' [and she knows it's for food] 'Que rico beso' and she actually puts her face up for a kiss when I say: 'Give me a kiss' and says 'Que rico beso' along with me when I kiss her between her eyes AND she has been practicing 'I love you! ', too!. She has also learned what 'No! ', 'Don't touch!' and 'That's not yours' means as well as 'Drop it! -this is because she is always and forever stealing things from me - things she shouldn't be touching -like the cap of a pen or a feeding syringe, for example- and although she knows what Drop it! means, she takes off flying instead of dropping whatever she has in her beak making me run after her like a chicken without a head through the entire house until she finally drops it. She has also become extremely possessive of me and scares off all other birds from not only my person but also from a stick that I might be using to move a bird from one point to another. BUT she has learned to 'share' me with Codee GCC and is now beginning to allow Zoey a bit of access to me so she is learning. Now the new birds. A friend of mine from my Waggin' Tails days with whom I have kept in contact through Facebook contacted me about another friend of hers who has stage IV cancer [started in the breast and now has spread to her lymph nodes] and wanted to find a home for her IRN's. They are two females who are used to living together, she had them for six or seven years and had gotten them from a previous owner but she didn't know how long this previous owner had had them or even if the lady was their first owner to begin with so they could be 8 or 18 years old for all I know. One of them is an albino with the red eyes and everything [her name is Casper] and the other is a phenotype named Peaches. I got them last night so I can't tell you much about them except that I think Peaches has liver damage... Her front is all plucked, her keel bone is too protruding, her urates don't look too good and they both have been free-fed a high protein diet of seeds [with hemp!!!!] for, at least, the last 6 or 7 years so chances are, she already has fatty liver and not in the first stages, either... This morning, I put them in a flight cage I brought up from the basement and placed in my dressing room for quarantine but I am not going to keep them there for more than two or three weeks because that should be more than enough time for them to calm down after the move [if they are asymptomatic carriers -which I doubt-, they would only shed the pathogen when under stress]. I put a nice branch with leaves and everything in it [I figured they would feel better if they could 'hide' behind them] and, once I had all the birds back in their cages eating their breakfast, I put them in it with the gloop already in [I usually wait a couple of days before I switch them to gloop but I made an exception this time because of the suspicion of liver malfunction] and OMG, you should have seen Peaches go for it! She dove right in and ate and ate and ate until her crop was visible, it was so full! Poor thing must have been desperate for some nice fresh, wet food! Casper got a wing hurt on the trip [not with me, with her previous owner] but i did not even try to check her out because it had just a bit of blood on the edge and she was opening it and closing it without a problem so I figured it's better not to stress her out more. She did not go for the gloop right away but she did drink water and was preening herself so it's all good. I am going to put both of them on a detox regime and wait a couple of months before I take them to the vet to get a bile acids and see what's what but, after being free-fed hemp seed for 6 years, liver cleansers and tonics are a must.